This page details my experience of replacing the plates on my quad skates. I hope that when you see how easy it is then you might have the confidence to do the same. At around two years old my Suregrip GT50 skates are in a poor state. I have drilled/stitched the soles on to the uppers on both skates. Then one of the plates suffered a fracture at the point where the front truck pivots. This is a key stress point when on the toe stop. As a stop gap measure I strengthen the spine of the plate with metal plates on both sides and added a spacer between the plate and sole of the boot. These repairs held, though I had to replace on of the screws three times because it snapped. I first considered getting Suregrip plates in the hope that the mounting holes would be in the same place as the existing plates. After much research and comments from fellow skaters I decided against them. Many people recommended Roll Line and so I went with the second cheapest plates, Blasters. Choosing the size was easy. I measured the wheel base and plate length and found the nearest match, the 170. I also specified 8mm axles, the default on Roll Line is 7mm. I didn’t want the expense of having to replace bearings in two sets of wheels. Before you start remove the wheels, laces and insole. The GT50 is a budget skate and they are built in the expectation that the plate will not be replaced. The tip of each mounting bolt (four on each skate) is melted so it is impossible to remove the nut without first cutting the tip off. Once this is done use the flat blade screwdriver to brace the bolt and undo the nut with the adjustable spanner. The plate will come away easily and the bolts can be pushed through in to boot. It’s important to fit the new plates true. I used the existing holes to find the centre line and worked to that. 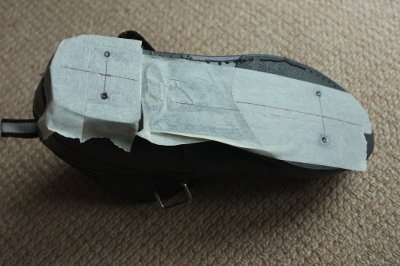 Start by applying masking tape the sole and marking where the existing holes are. Measure the distance between then across the skate and mark the centre point. Do this for both sets of holes. Join these to centre points with a line. This is your centre line. Now hold the new plates to the sole and using your skill and judgement align it true to the centre line. 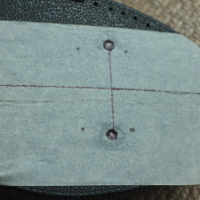 Also note the distance from the back of the plate to the back of the heel. Carefully mark a dot on the masking tape through the centres of the mounting holes. The Blaster plates take six bolts per plate and, fortunately, they are fairly well clear of the existing holes. Remove the plate and compare your marks to the marks of the old holes. They should all be symmetrical about the centre line. If they are then you’re ready to drill. Roll Line use different bolts to the rest of the world – what a surprise! I found a 4mm drill to be the perfect size. When drilling make sure that the drill is perpendicular to the sole. Also watch that the drill doesn’t pull itself into the sole and then into the upper/your leg/etc. 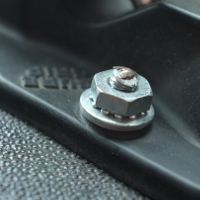 Push the bolts through the holes from inside the boot and make sure that they line up with the plate. It’s a good idea to put the washers and nuts on and tighten then a reasonable amount. You’ll note that they are way too long and need cutting down. 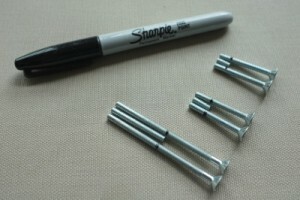 Mark the bolts so that you know where to cut them then remove them from the skates. Don’t cut them too short, I’ve left a little under 10mm of thread extra. You can cut the bolts for the other foot to the same length. When cutting the bolt don’t cut right through in a single cut. When you are almost through, but before the remainder is so thin that the bolt starts to bend, rotate the bolt almost 90 degrees and cut through. This will reduce the amount of filing that you’ll need to do to finish the end. 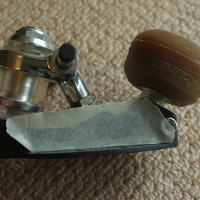 This gets rid of sharp edges but also cleans up the end so that the nut goes on more easily. Now you’re ready to mount the plates. I put masking tape on the spine of the plates near the bolt holes so as not to mark them up if the spanner slipped. They need to be tight enough so that the bolt head beds into the inner sole of the boot nicely. That’s it. Replace the inner sole, laces, wheels, toe protector, fit the toe stops and you’re good to go!